Are you concerned about Australia’s impact on the world? If so, you should tell the Government what you think. The Australian Government is currently calling for public submissions for its Foreign Policy White Paper. If you feel as we do about the direction of Australia’s foreign policy and are concerned about where it could be headed next, make a submission on the Foreign Policy White Paper by Tuesday 28th February. 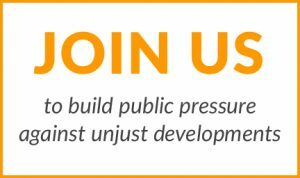 Read the issues AID/WATCH will be raising in our submission here. You can make an online submission using the text provided below, or feel free to add to the text in your own words, drawing on one or more of the seven issues raised below. Alternatively, you can send your own submission by viewing the government white paper website. Australia’s current foreign policy framework was set by John Howard and Alexander Downer in 2003, with the last White Paper, ‘Advancing the National Interest’. The 2003 policy prioritised the US alliance and relations with the EU above regional Asia engagement, and pursued corporate interests at the expense of public interest. The result was a policy that actively sought to change global norms by breaking or sidestepping them. The approach has been profoundly counter-productive and short-sighted. The impacts of Australian norm-breaking are now being felt today in terms of a rise in ethno-populism, unilateralism and global insurgency, and by on-going and intensifying climate, food and financial crises, to name a few. Norm-breaking by Australia has legitimised norm-breaking by others. Today we are reaping the whirlwind from Australia’s ‘deputy sheriff’ posturing and ‘shirt-fronting’ antics. The result is a far less stable world that directly threatens Australians’ well-being. Australians are fully aware of the risks – the 2015 Lowy Poll found 58% were concerned the US alliance will draw Australia into a Pacific war. The Government consistently fails to heed the warnings and in fact has been accentuating the problem. By pursuing Australia’s own narrowly-defined security and corporate interests, the Australian Government has made the world less safe and reneged on its responsibilities to its own people. It is high time for a major evaluation and rethink. Leveraging corporate power through extended ‘market access’ into poorer countries, along with rules that allow corporates to sue governments for reduced profits. Examples include bilateral and multilateral trade and investment agreements such as the US Free Trade Agreement (USFTA), Trans-Pacific Partnership, and the Pacific ‘PACER+’ agreement, which are designed to sidestep opposition from poorer countries at the World Trade Organisation. Australia’s record on global climate policy is derisory – it is less a laggard than a wrecker. The World Bank states the climate crisis is reversing development on a global scale. Yet Australia has had the lowest emissions reductions amongst high-income countries, and tries to displace its responsibilities onto poorer countries. At home, Australia only digs the hole deeper – attacking renewables while subsidising coal and gas for export. Australia now exports double the emissions it burns at home. Australia consistently supports authoritarian allies, such as in Saudi Arabia, Israel, Egypt and Afghanistan. It is one of the very few major powers refusing to condemn Israeli state violations of international norms. It has even criticised US abstention on the issue. Remarkably, Australia imports Israeli military drones. Meanwhile, Australia’s regional policies negate human rights, from grabbing East Timor’s oil, to ignoring human rights abuses in West Papua. At the International Monetary Fund and World Bank Australia promotes finance markets as the cure-all, fueling debt and speculation and stoking the global food crisis. In the aftermath of the 2008 financial crisis Australia argued against effective financial regulation at the G20, instead favouring window-dressing via ‘transparency’. Meanwhile, Australia’s export credit agency, the Export Finance and Insurance Corporation (EFIC), is busy creating potential debts for low-income countries on behalf of Australian corporates. Australia’s refugee policies directly conflict with and undermine global norms on the right to protection from persecution. Its bipartisan policy of deterrence by detention is tantamount to rendition, likened to a form of kidnapping and forced exile. The logic of deterrence enables the wholesale denial of basic rights, creating permanently stateless and extra-legal encampments. Australia’s abuses encourage copy-cat actions, in a global bidding war to dehumanise and brutalise refugees. Australian overseas aid now primarily serves the national interest rather than development outcomes, and is no longer linked to UN targets. It has been renamed ‘aid investment’, not ‘development assistance’. Aid is no longer distributed by an agency with a development mandate, and has been redirected to support private sector players and narrow security priorities. It is at its lowest level since the 1970s. As it becomes a diplomatic slush fund aid has lost public support, and is a soft target for budget cuts. These and other foreign policy failures demonstrate the nonsensical logic of pursuing naked ‘self-interest’ at DFAT. 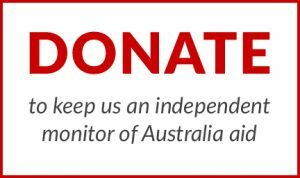 At AID/WATCH we have the freedom to make our views clear; inside the Australian Government, the concerns are no less intense, though we have to read between the lines. The 2014 internal ‘Capability Review’ at DFAT was a rare moment for punches not to be pulled. DFAT strategy was found to be weak in outcomes, collaboration and common purpose; planning and prioritisation were also weak (REF 2014). While the language remained muted, the message is clear – DFAT is rudderless, lacking any sense of policy direction or strategic rationale. The White Paper’s Terms of Reference do not inspire confidence that the kind of wide-ranging review and evaluation that is so desperately needed will be on the table. The consultation process for the 2015 Defence White Paper was informed by a 51-page Issues Paper, a ‘Discussion Paper to Inform the 2015 Defence White Paper’. Any such issues paper is absent from the DFAT White Paper process. Instead DFAT provides a one-page series of questions, framed by leading statements such as ‘Australia’s foreign policy needs to be grounded in a clear-eyed assessment of our national interests’. The DFAT White Paper process is delimited from the outset. Yet the consultation process is an important opportunity for alternative views to be made clear, and to demonstrate that the wide public disquiet. Opinion polls show there is precious little public support for a continuation of the current failing approach, and it is important this be reflected in the White Paper process. AID/WATCH believes there is a desperate need for a strategic rethink to pursue peace and security grounded in internationally-agreed principles, not in narrow self-interest, and we urge you to help us in getting this perspective on the agenda.